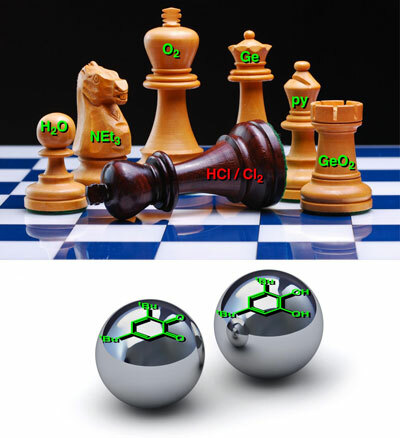 (Nanowerk News) A team of chemists in Canada has developed a way to process metals without using toxic solvents and reagents. The system, which also consumes far less energy than conventional techniques, could greatly shrink the environmental impact of producing metals from raw materials or from post-consumer electronics. "At a time when natural deposits of metals are on the decline, there is a great deal of interest in improving the efficiency of metal refinement and recycling, but few disruptive technologies are being put forth," says Jean-Philip Lumb, an associate professor in McGill University's Department of Chemistry. "That's what makes our advance so important." The discovery stems from a collaboration between Lumb and Tomislav Friscic at McGill in Montreal, and Kim Baines of Western University in London, Ont. In an article published recently in Science Advances ("A chlorine-free protocol for processing germanium"), the researchers outline an approach that uses organic molecules, instead of chlorine and hydrochloric acid, to help purify germanium, a metal used widely in electronic devices. Laboratory experiments by the researchers have shown that the same technique can be used with other metals, including zinc, copper, manganese and cobalt. The research could mark an important milestone for the "green chemistry" movement, which seeks to replace toxic reagents used in conventional industrial manufacturing with more environmentally friendly alternatives. Most advances in this area have involved organic chemistry - the synthesis of carbon-based compounds used in pharmaceuticals and plastics, for example. "Applications of green chemistry lag far behind in the area of metals," Lumb says. "Yet metals are just as important for sustainability as any organic compound. For example, electronic devices require numerous metals to function." There is no single ore rich in germanium, so it is generally obtained from mining operations as a minor component in a mixture with many other materials. Through a series of processes, that blend of matter can be reduced to germanium and zinc. "Currently, in order to isolate germanium from zinc, it's a pretty nasty process," Baines explains. The new approach developed by the McGill and Western chemists "enables you to get germanium from zinc, without those nasty processes." To accomplish this, the researchers took a page from biology. Lumb's lab for years has conducted research into the chemistry of melanin, the molecule in human tissue that gives skin and hair their color. Melanin also has the ability to bind to metals. "We asked the question: 'Here's this biomaterial with exquisite function, would it be possible to use it as a blueprint for new, more efficient technologies?'" The scientists teamed up to synthesize a molecule that mimics some of the qualities of melanin. In particular, this "organic co-factor" acts as a mediator that helps to extract germanium at room temperature, without using solvents. The system also taps into Friscic's expertise in mechanochemistry, an emerging branch of chemistry that relies on mechanical force - rather than solvents and heat - to promote chemical reactions. Milling jars containing stainless-steel balls are shaken at high speeds to help purify the metal. "This shows how collaborations naturally can lead to sustainability-oriented innovation," Friscic says. "Combining elegant new chemistry with solvent-free mechanochemical techniques led us to a process that is cleaner by virtue of circumventing chlorine-based processing, but also eliminates the generation of toxic solvent waste"
The next step in developing the technology will be to show that it can be deployed economically on industrial scales, for a range of metals. "There's a tremendous amount of work that needs to be done to get from where we are now to where we need to go," Lumb says. "But the platform works on many different kinds of metals and metal oxides, and we think that it could become a technology adopted by industry. We are looking for stakeholders with whom we can partner to move this technology forward."